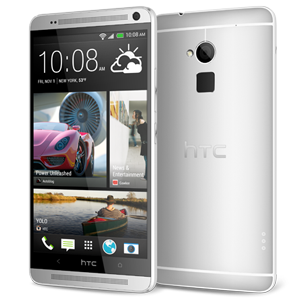 The HTC One Max is the older sibling of HTC's flagship device, the HTC One. The size of the One Max certainly puts it into phablet territory. Powered by a Qualcomm 1.7GHZ quad-core processor, the device has 2GB RAM, 16 or 32 GB of internal storage and an additional microSD card slot capable of reading up to 64GB. The large 5.9" Super LCD3 display has a resolution of 1080 x 1920, giving it a pixel density of 373 ppi. A fingerprint reader is intagrated on the back cover of the device, which enables fingerprint security, as well as quick launch of your favourite applications. The One Max shares the same 4MP camera as the HTC One, which features full 1080p video recording. The battery weighs in at 3300mAh.